Gloucester-based IT company, System 15, create clever custom-built software, develop beautiful, functional websites, and provide reliable, jargon-free IT support. Their expert team help Mac and PC-based businesses get the best out of their IT. 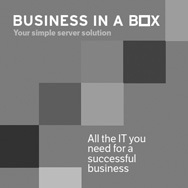 System 15 had an idea for a great new product – Business in a Box. This simple, affordable IT solution contains everything a small business needs to get started, from anti-virus protection and cloud-based email to a reliable backup system. They needed a brochure that enabled them to promote this technical solution to non-technical business owners in a clear, compelling and persuasive way. The project involved working closely with System 15’s designer, Adam Vines from www.loungedesign.co.uk. We began by meeting to establish the benefits of the solution, decide on key messages, and start thinking about taglines for the product. Adam produced a great design, which System 15 loved, and I wrote the copy to fit the approved design, making the process very efficient. Communication was clear from start to finish, and the result is a great looking brochure that promotes the benefits of a technical product in a way that any small business owner can understand. “Due to the technical nature of Business in a Box it was vital to ensure the brochure copy was easy to understand and would appeal to decision makers. Sarah’s brief was to translate this technical concept into a clear, benefit-led message. “It’s extremely difficult to create copy that reads well and conveys a clear sales message about your product or service. It doesn’t matter how good your offering is – if the copy isn’t right you will lose potential clients. “You have such a small amount of time to grab the attention of your customer and deliver your message, and if your copy isn’t clear, persuasive and appealing then your client may never know how good your product really is.